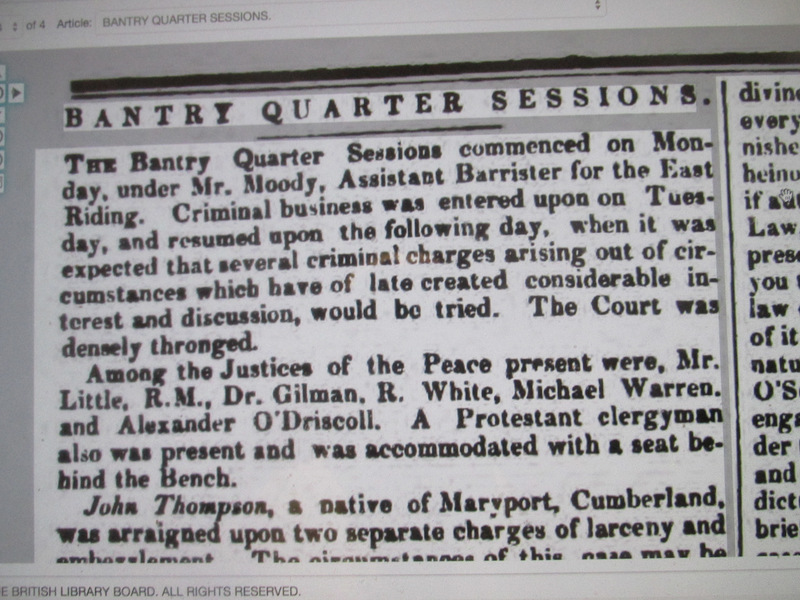 Bantry, West Cork, Quarter Sessions, February 1842, Chaired by Mr. Moody, Assistant Barrister, East Riding, Magistrates, Mr. Little Resident Magistrate, Dr. Gillman, Richard White (Lord Bantry family), Michael Warren, Alexander O’Driscoll (Middle Man, Caheragh, married to Miss Evans Lissangle). 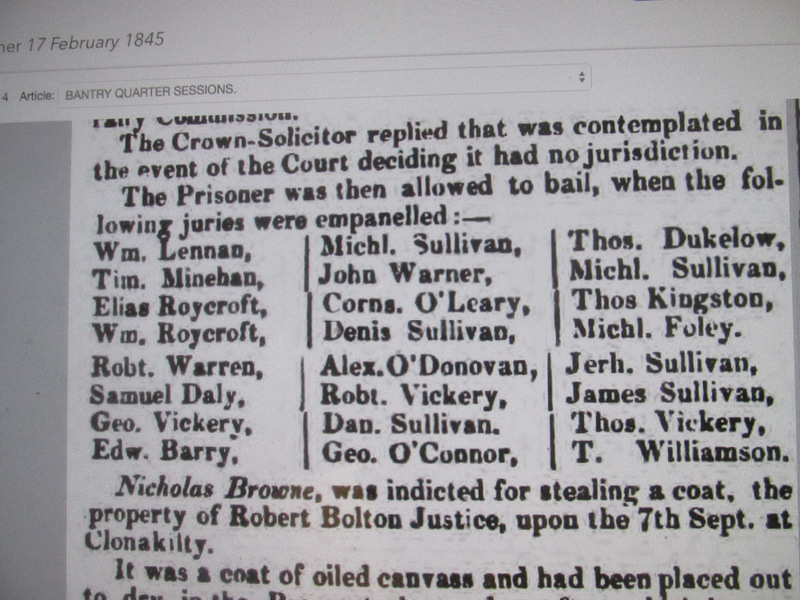 Juries: William Lannin (Possibly later Master Workhouse may be from Dromreague), Elias Roycroft (Rooska), William Roycroft, Robert Warren, Samuel Daly, George Vickery, Edward Barry, Michael Sullivan (Possibly Tedagh), John Warner, Cornelius O’Leary, Alexander O’Donovan Possibly Clerk Petty Sessions), Robert Vickery, Daniel Sullivan, George O’Connor (Landowner Bantry/Skibbereen), Thomas Dukelow (Durrus possibly Clashadoo), Michael Sullivan, Thomas Kingston, Michael Foley, Jeremiah Sullivan, T Williamson (Durrus), James Sullivan, Thomas Vickery. Elisas Roycroft of Rooska had he faimily with daughter name Margaret who married Sullivan from area. ?